Home> News> Happy International Day of peace! September 21 the International day of peace is celebrated all over the world. In 2018 the theme is: “The Right to Peace — The Universal Declaration of Human Rights at 70”. The UN Resolution 36/67 established the International day of peace in 1981. 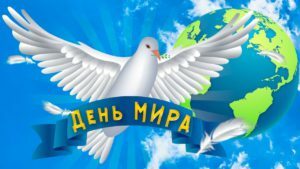 On September 7, 2001, the UN proposed to expand its importance, calling on warring parties around the world to declare an annual world day of ceasefire and non-violence. The International day of peace has been celebrated annually on 21 September since 2002. A symbolic March of Peace, initiated by the Indian philosopher-peacemaker Sri Chinmoy, is one of the integral parts in the frame of the Day of peace since 1986. By participation in this action people express their devotion to the ideas of peace, solidarity with other people on different continents and in other countries.